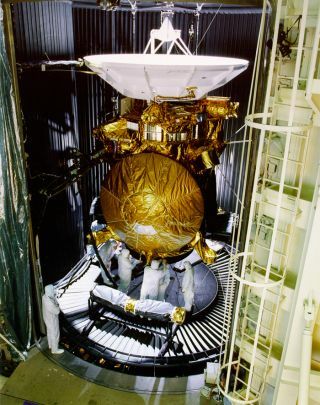 The Cassini Saturn probe goes though vibration and thermal testing in October of 1996 in preparation for its four year mission. In this historical photo from the U.S. space agency, the newly-assembled Cassini Saturn probe undergoes vibration and thermal testing at the JPL facilities in Pasadena, California. It was subjected to weeks of "shake and bake" tests that imitate the forces and extreme temperatures the spacecraft will experience during launch and spaceflight. Cassini's mission is to orbit Saturn for four years and study the planet, its rings and moons in detail. The large moon Titan is a principal target for exploration, and Cassini will carry the Huygens probe, (gold-mylar circular object seen here mounted on the front of the spacecraft) to be released to enter Titan's thick atmosphere and descend to the surface via parachute. The Huygens probe is provided by the European Space Agency (ESA) and the radio antenna at top was provided by the Italian Space Agency (ASI). The project is a joint endeavor of NASA, the European Space Agency and the Italian Space Agency. JPL manages the program for NASA's Office of Space Science, Washington, DC.